Leaves for Trees: Blog awards - what do you think? Recently I have been blessed to be nominated for two blog awards: The Liebster Award by Nancy at My Ancestors and Me and the Wonderful Team Member Readership Award from Shel at My Genealogical Journey, Debra at In Black and White and Debi at Who Knew?. I was really pleased to be recognized by these great bloggers. In doing some research on the origins of these awards, I came across some posts on different blogs where the bloggers were none too pleased about having to respond to the awards. In fact, one even said they thought blog awards were stupid. Hmm. To be fair, I was so deep in links that I couldn't even begin to find my way back to the original post that I found. But it still got me wondering: What do I think about blog awards? The bottom line is that while I think some of titles for the awards are a bit "stupid," I think the concept is great. I find myself going and exploring the blog that nominated me and finding links to the blogs that they love. Just over this past round of recent blog awards I've started following two new blogs. It has shown me some new reading links and there are many positives for that. And now that Geneabloggers, our main source of connecting with fellow genealogy bloggers, no longer has "roll-ups" for the daily blog topics, blog awards give us a chance to market ourselves and our other favorite blogs to new readers. And last but not least, it sure does feel nice to be recognized. I now know that there are several readers that enjoy my blog. My blog is a creative outlet for me, but I have to admit that it feels great to know that others enjoy it too. Blog awards are like a little pep talk to keep chugging and another way for me to give a pep talk to my fellow bloggers. So, forget the "stupid" names and the extra time it takes to respond to blog awards. Be happy that someone cares enough about your Internet outlet to recognize you! What do you think about blog awards? I like blog awards for the reason's outlined. I blog mostly for myself and my family, but if someone else was so taken by my literary genius, I will certainly appreciate any recognition they may give to that end. Was it Caroline Pointer's post at http://www.blogginggenealogy.com/1/post/2013/01/blogging-genealogy-blog-awards-seo.html that you read? 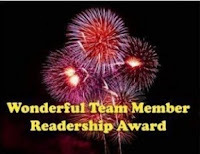 Although I appreciated being nominated for this award too, (the Wonderful Team Member Readership Award), and I thanked the two fellow geneabloggers who nominated me, I don't want follow all the "rules" and post about this on my blog, as it feels like a chain letter to me. I hope no one is offended. I appreciate others' points of view and I liked your post. I have gotten that feel about some of the awards, too, Elizabeth. Like when I first started blogging and people I had never heard of were giving me awards. But this most recent round started with someone I respected giving me the award and it seemed heart felt...not just slapping names down to meet some "rules." You are right, it is a lot like a chain letter and I think it can quickly turn in to slapping names down to check a block. But I read many, many posts from this recent round of awards and overall it seemed like the people genuinely liked the blogs they mentioned. And there were some people that didn't participate and I think that is great, too. Because, ultimately, if it doesn't fit with your blog's scheme then it is the right choice for you. Thank you for sharing! Heather, you are really a wonderful reader and commenter because you've already received the award I'm giving you. (I forgot!) Anyway, it's Wonderful Team Member Readership Award. I guess you don't have to do another post for it.... Anyway, you can read my post about it at http://nancysfamilyhistoryblog.blogspot.com/2013/01/my-favorite-award-to-give.html. Thanks for being such a great supporter, both reader and commenter, of my blog, Heather. I appreciate it!